One image from last Sunday's Rio de Janeiro derby between Fluminense and Flamengo -- otherwise known as "Fla-Flu" -- went viral in Brazil, but it did not come from the pitch. 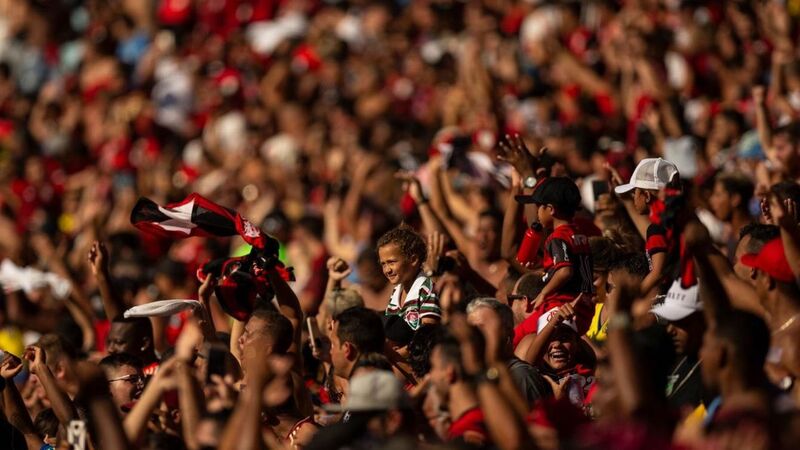 It's a curious image of a little girl in the stands of the Maracana stadium. Brazilian football had another day of unprecedented chaos on Sunday when fans were allowed into the Maracana Stadium midway through the first half after a judge lifted a ban imposed when rival sides could not agree in which end their fans would sit. The gates were opened around 30 minutes into a Rio state championship final to allow thousands of Vasco da Gama supporters, and a few from rivals Fluminense, into the ground. After the horrific tragedy of two years ago, Chapecoense's first-divison fate will come down to the final game of the season. It is precisely two years since the Chapecoense plane crash, when almost the entire team and coaching staff of the little Brazilian club lost their lives. In such circumstances, it seems crass in the extreme to state that Chapecoense are fighting for their first-division survival this weekend. Such metaphors lose all their meaning when measured against true tragedy. The dramatic Copa Libertadores semifinal between reigning champions Gremio of Brazil and Argentine giants River Plate went to a third leg. After the first two, in conventional home and away format, River Plate had scraped into the final. Aggregate scores were level at 2-2. But River's late penalty gave them the extra away goal, and a place in the final against historic rivals Boca Juniors. Until, that is, Gremio lodged a complaint. Diego Cavalieri worked with Roy Hodgson at Liverpool. Goalkeeper Diego Cavalieri has joined Crystal Palace until the end of the season. Cavalieri, who worked with Palace boss Roy Hodgson during his time at Liverpool, joins as a free agent after leaving Brazilian club Fluminense at the end of last year. The 35-year-old former Brazil international has been added to Palace's squad after a successful trial spell with the Eagles. "I am very happy to be here and have been training with the guys for some time now," he told the official Palace website.